I recently started trying my hand at mosaic art. My sister and her husband had an old pine table. I thought it would be neat to try and make a mosaic inlay, so they routered out the table and I started looking for ideas. Both my sister and her husband have a passion for that "south west"/ "Mexican" art style so we decided it would be an iguana. 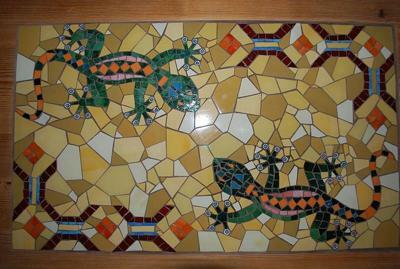 I was inspired by an iguana pattern found in a mosaic art book and they designed the pattern around the edge of the table. We combined both elements using Photoshop and got a mosaic pattern for the table. I love millefiori with its delicate beauty and how much fun it can bring to a mosaic so I used it to make the ends of the toes. The body is made with Italian smalti and the background tiles are Mexican hand painted ceramic tiles. I will be doing a second piece for the table which will be on the leaf so that when the table is fully opened it all pulls together. I really hope to buckle down and explore this medium as much as possible.